So what if it’s cold, get outside and RUN! Winter running can be refreshing, peaceful and fun but knowing what to wear and the options for various conditions is important. 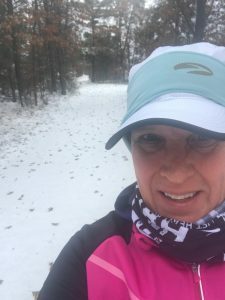 I’ve loaded this with tips and links to lots of options to convince you that winter running can be comfortable and fun! 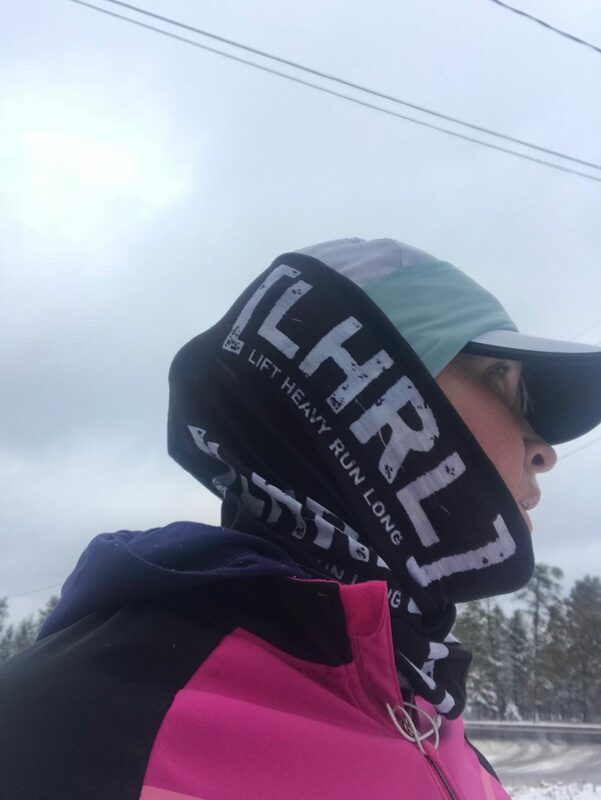 I never think twice about winter running in northern Michigan because I have quite a lot of warm gear to layer on depending on the wind, temps, and moisture. 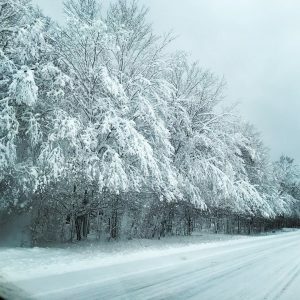 However, if you’re new to running or sick of the treadmill in your basement or the gym all winter and want to get outside in the cold, I have tips for you! First, if you are in a snowy area, having a good pair of trail shoes with heavy lug soles for traction is ideal. If you live in an area with a lot of ice, you have some great options. There are shoes called Ice Bugs and my friend Joanna runs in the mountains around the Calgary area in western Canada and LOVES Ice Bugs for all her winter trails. She’s on Instagram as jford.welsh and you’ll be stunned at the winter conditions she runs in. If you only run on icy stretches occasionally or you’re just getting started with cold weather running, you can take a slightly older pair of running shoes and put screws into the soles. I have many friends that do this with great success. This is a great tutorial on how to do that. Simple, effective, inexpensive. I don’t recommend the YakTrak slip on traction cleats and various ones like them. I’ve used them and similar models and they screw up my form and my hips are hurting in less than 30 minutes. They wear out quickly and are a real bugger to get on my shoes. However, many people love them so check them out if you’re so inclined. Find what works for you! One thing that will make a huge difference in your winter running success is learning correct form. Heal strikers are going to end up on their rear ends quickly. Check out the running programs at the LHRL website and load up the 321 Run program by Valerie Hunt. It made an incredible difference in my footing on winter paths. You learn proper running form, better technique, and better foot placement for running. The tricky one and the one that takes the most practice is WHAT TO WEAR?! I know many runners froze their thighs and bums off at the Tunnel Hill race this past weekend in temps they aren’t accustomed to running in much or ever for that matter. Investing in a couple key pieces of clothing can make a huge difference in your comfort level. Just like we can run in old white cotton socks, sweat pants, and cotton shirts in the summer, it’s not ideal and we’re a lot more comfortable after we invest in some breathable technical fabric based clothing. No matter what, every runner, no matter how much you run in the cold, will invariably overdress for the first couple cold weather runs because we aren’t in the mode to pick the right layers. It happens to all of us so just laugh it off. Dress in layers and be happy to remove what you need as the wind changes or sun comes out. One piece of winter gear I will never be without is a buff like the one I’m wearing below. You can pull it down around your neck, you can pull it up and anchor it on your head like I do in the picture to protect your face; it has a ton of uses and yet you can easily pull it off and tuck it in your pocket when you don’t need it. In the picture on the right I pulled it down and left it around my neck to keep the wind off my chin and neck. What you may not know is there are fleece types of winter running buffs/neck gators. You can also invest in a balaclava but those are normally way too hot for me. I like the running hat with wind proof head band combo like I am wearing in the picture for a lot of my winter running. I switch to a very lightweight scull cap of some type if temps drop below 10F. My head sweats a lot so I don’t need a lot of warmth up there. Finding winter running gear must be tough for those of you south of Michigan where I am at. All our stores, even Walmart carry winter athletic gear. I always tell people that the best gear for winter running is actually cross country ski gear. REI has a great selection to check out and get started with looking at options. The best brands that wear well, do the job, and look good are Craft and Swix. I love both and the pink jacket in the picture above is by Craft. It’s vented perfectly, blocks the wind, and doesn’t leave me soaked in sweat. Winter tights/pants are crucial. Get something with wind block panels in the front if you live in a windy area or your thighs are always cold. I have about 6 pairs of winter tights in variable weights. When it gets really cold, I actually layer them. A pair of old school nylon wind pants are a cheap and easy piece to add to your winter gear and can really help on super windy days. A light pair of tights underneath them and your thighs will thank you. Once you have a good winter running jacket, tights, buff, and shoes, you need a couple long sleeve layers to pick from and a decent pair of socks. I like Smartwool running socks for winter. Get taller ones to cover your ankles though if you run in snow. Frozen ankles aren’t fun. They have those in the REI link I shared above. Icebreaker is a newer line of clothing that is fabulous but really pricey. I know many winter runners who love their line of clothing but my budget isn’t that big. You can pick up some great deals on winter gear at Sierra Trading Post and search for specific brands like those I listed above. Gloves are important, too. Find the right combo for your hands. Mittens, gloves, fingerless gloves, etc. I also recommend those hand warmer packets they have at the gas stations where you open them and they heat up. Those are fabulous if your gloves get wet or temps drop. I’ve even tucked them in my sports bra to get my core temp up when the wind changed and temps drop suddenly. For hydration on long cold winter runs, I recommend a hydration vest UNDER your jacket. The warmth of your body will keep the bladder bag from freezing. Be sure to blow back into the tube after you drink though or you’ll have a frozen tube with no water coming through. Here’s the thing – I just want more people to get outside in the winter. Enjoy the beauty and peacefulness of the season. The trails are quieter, animals are hibernating, and hopefully, the mud is frozen where you are. Once we get enough snow I am on my cross country skis as much as I can manage. Luckily, I have 3 amazing groomed trail systems less than 20 minutes in any direction of my house. Oh yes, I’m living the dream! Try cross country skiing, try fat tire biking, try snow shoeing, just get out there this winter. And forget about pace for the winter if you’re on ice and snow. Slow down and enjoy the season. 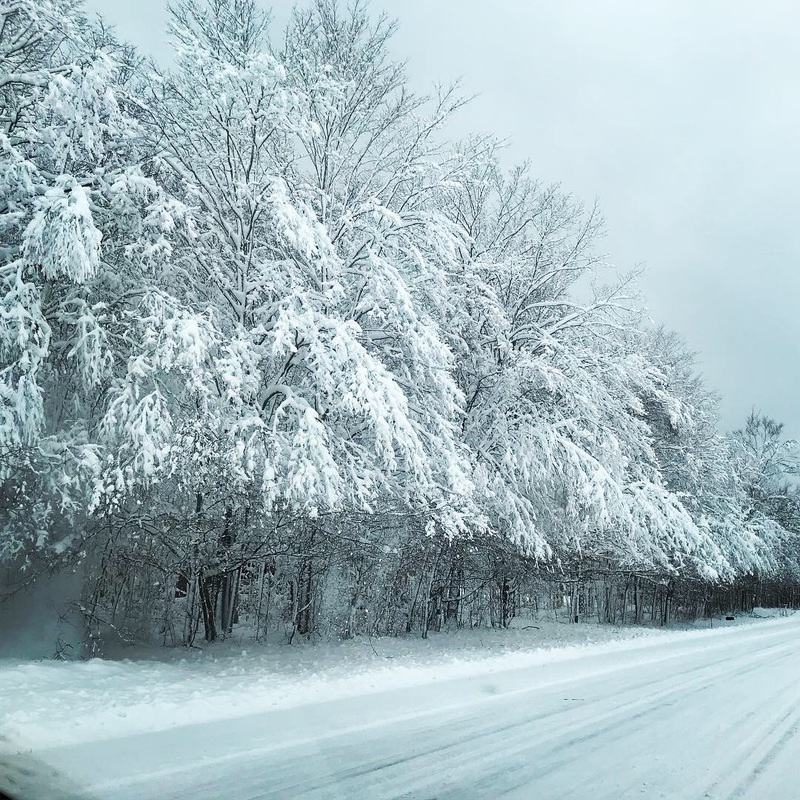 Taken Nov. 11, 2018 in the Eastern Upper Peninsula of Michigan where they got quite a load of snow. 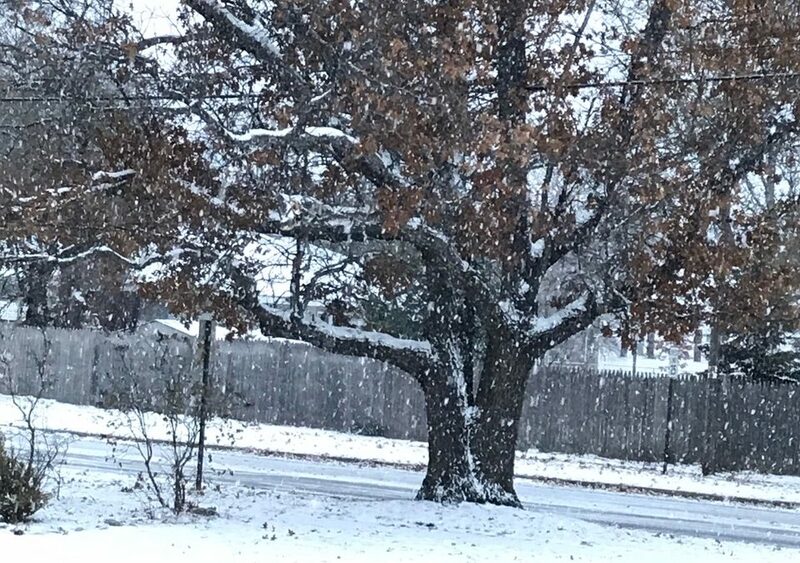 So pretty but quite early in the season for this much snow.